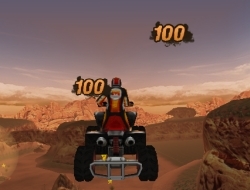 Quad bikes are really fun to ride and this is what you will do in this amazing 3D racing game. The goal is to rank as high up in each race as you can and also on the way you will need to try and collect the M symbols and the stars for a better score. Watch your mini-map to see where they are and try not to avoid them. Also you will be competing against four other competitiors and they will not be afraid of a collision or two if it takes you out of the race. Jump off the ramps to clear the gaps in the terrain and try not to get slowed down by all the bumps, rocks and water. Use the arrow keys to drive and X for the look behind. Extreme Quad 8.00 between 0 and 10 based on 1 votes.